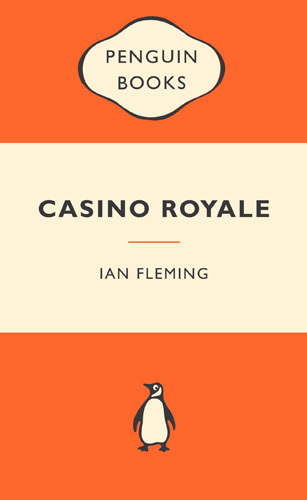 Penguin Books in Australia has published Ian Fleming’s first James Bond novel, Casino Royale as part of their “Popular Penguin” line. It joins other great classics such as One Flew Over the Cuckoo’s Nest (Ken Kesey), The Great Gatsby (F. Scott Fitzgerald), Clockwork Orange (Anthony Burgess), Breakfast at Tiffany’s (Truman Capote), Pride and Prejudice (Jane Austen), Jane Eyre (Charlotte Bronte), Of Mice and Men (John Steinbeck), The Big Sleep (Raymond Chandler), Frankenstein (Mary Shelley), and many many others. The book is available for $9.95 according to Penguin’s website. James Bond has become a true cultural icon, Casino Royale has action, suspense, even romance – yes, Bond falls for that “bloody woman” – but most interesting and valuable, it provides a fascinating glimpse into a world long gone. No doubt this is one of Penguin Classics most popular picks.